But before we rush to embrace body cameras as an answer to police accountability concerns, let’s carefully consider whether the value of body cams to the public is being oversold – and whether they bring a host of new problems that have no easy solutions. First, keep in mind that police body cams do not record officers – their lenses are focused on civilians. They are worn on the chest or stem of the officer’s glasses and so the field of vision is limited. Amid the confusion of a fast-moving incident, they provide just a partial, potentially obstructed and often unclear picture of what transpired. And since one doesn’t know when an encounter will turn problematic, the cameras must always be on. Otherwise we’ll see repeats of Spokane’s experience, when the first police shooting since the launch of its body cam program was not recorded because the officer’s camera was off. If cameras are to be effective for accountability, officers cannot have the discretion to turn cameras on and off as they choose. And the department must spell out sanctions for officers who fail to follow the always-on policy. Law enforcement officials don’t want to limit the use of camera footage to police oversight uses. But without this restriction, police will become roving tools of mass surveillance. Cameras will document the activities of not only suspects, but also countless victims, witnesses, bystanders, and people simply out in public. Mission creep will be a near-certainty, leading to dragnet surveillance of protesters and fishing expeditions through images of people not suspected of wrongdoing. Body cameras also create other risks to privacy. Because government transparency is a crucial principle of democracy, journalists and the general public have the right to access government records. So, video captured by these cameras will be accessible to anyone and everyone through public record requests. Sensitive footage of people in emotional crisis, domestic violence victims, and other people in vulnerable circumstances will become publicly available. And it is easy to imagine some people creating “best of drunk and disorderly conduct” YouTube channels for commercial gain or harassment purposes. Crafting ways to protect individual privacy while still preserving the public’s access to government records is a very complicated proposition. Technologically limiting access and use, for both the government and the public alike, of all body camera video unless it is the subject of a police misconduct complaint may be the only reasonable way to address this. Even when an officer involved death has been recorded, the video evidence does not necessarily ensure accountability. The officers who choked Eric Garner to death in New York are still on the job despite a clear video of the killing and violation of NYPD policy. 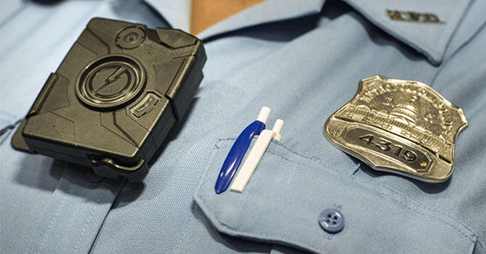 Body cams are not a quick solution to police misconduct against communities of color. We need real accountability and enforcement programs that target and punish misconduct combined with the long, hard work of changing police culture by training officers in de-escalation tactics, holding supervisors responsible for officers’ misconduct, and teaching everyone in law enforcement to recognize and remedy their own biases. At very best, body cameras can only be one component of a much larger, comprehensive plan to address the problems entrenched in our police departments. At worst, they are a technological snake oil -- a proposed cure-all that fails to address the underlying problems of police misconduct and bias and instead brings us one step closer to a repressive surveillance society. To date, no police department in this state has proposed policies or guidelines that adequately address the many concerns raised by body cams. Before adopting body cams as a “fix” for police misconduct, let’s consider very carefully what the devices are going to do for us, and to us.